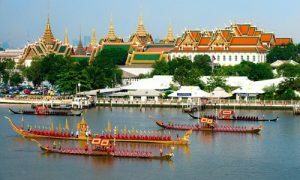 Bangkok (Thailand) – June 23, 2017 (travelindex.com) – A new study released by the World Travel & Tourism Council (WTTC) showcases that Travel & Tourism in Thailand is one of the strongest performing sectors out of nine sectors researched in the study. Business and leisure travel directly contributed THB1.3 trillion (USD$37 billion) to Thailand’s GDP in 2016, which is higher than all other eight sectors researched in the study. When you take the contribution from direct, indirect, and induced income, the tourism sector provided THB2.9 trillion (USD$83 billion), making it larger than mining, construction, chemicals manufacturing, financial services, agriculture, and banking. Travel & Tourism GDP is expected to grow at an annual average of 6.7% over the next decade, which is a stellar four percentage points faster than the country’s total economy growth predicted at 2.7% and significantly higher than the forecast for agriculture at 1.1% and mining at 2%.The sector directly supported 5.7 million jobs in 2016, which is 15% of all jobs in the country. David Scowsill, President & CEO, WTTC, said: “It is not news that Travel & Tourism is one of the strongest performing sectors in Thailand. Providing nearly 21% of the country’s GDP, the business and leisure travel market creates jobs and generates economic wealth. The WTTC Benchmarking Report is sponsored by American Express. The following sectors have been analysed in comparison to Travel & Tourism. They were selected as having similar a breadth and global presence as Travel & Tourism. work, additions, alterations, or maintenance and repairs.